WSBK Donington Park Race 2 results | IAMABIKER - Everything Motorcycle! 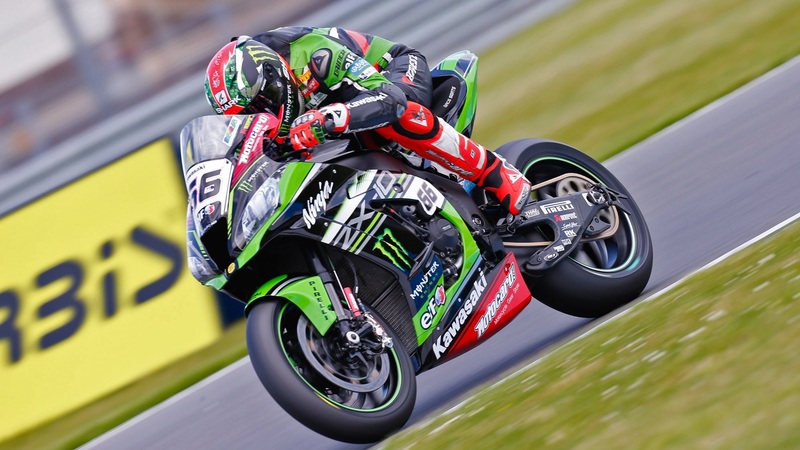 Tom Sykes wrote himself into the history books when he claimed his eighth win in a row at Donington Park but was pushed hard for it by Kawasaki team-mate Jonathan Rea. The Kawasaki duo were engaged in a furious battle for the lead from lap two onward after Chaz Davies ran wide at Goddards to let Rea through with Sykes leading. The championship leader put in a record lap to catch his team-mate and pass him down the inside at Melbourne Hairpin with four laps to go but hit a false neutral at the final corner which forced him to run wide and let Sykes back through. The move drove Sykes to put in consistently quick laps to gap Rea and ensure there was no last-lap theatrics. Sykes eighth victory in a row at Donington Park in WSBK now equals Carl Fogarty’s all-time record for most consecutive wins at one venue (Fogarty’s eight in a row was at Assen between 1993-96). As the lights went out, Sykes got the hole-shot while Davies wheelied off the line but recovered to keep second place with Rea moving into third. At the end of the first lap and as it was in race one, Sykes and Davies ran wide at Goddards with Sykes maintaining his position while Rea overtook Davies for second. Davies gratefully grabbed third place 4.4 seconds off the winner after a disastrous first race. Lorenzo Savadori claimed his best result of the season with fourth place on the IodaRacing Aprilia.